This set of class notes covers both Mendelian and non-Mendelian genetics. 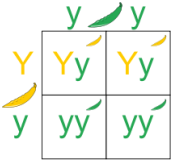 Topics include monohybrid and dihybrid crosses, simple dominance, incomplete dominance and codominance, multiple alleles, epistasis and polygenic inheritance. A brief discussion of the inheritance of human diseases is also included.